Comedy The Family Way, in which Amy-Joyce plays Sandra, had its International Premiere in New York at the Irish Screen America event. It has upcoming screenings at Irish Film London’s St. Patrick’s Day Film Festival and The Irish Film Festival Boston, as it kicks off its festival journey. 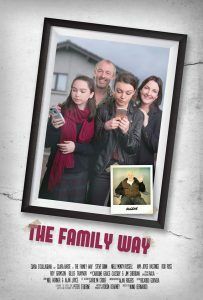 The Family Way was written and produced by Roisin Kearney, directed by Emmy Nominated Nuno Bernardo and stars Ciara O’Callaghan, Clara Harte, Steve Gunn and Oscar Nominated Jim Sheridan.